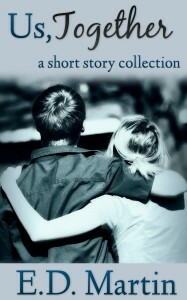 All month I’ve been pulling from my short story collection, Us, Together. Since today is Father’s Day, this week’s excerpt is from “Man of the House,” the second story in the collection. In this story, a little boy is confronted with his parents’ failing marriage as he spends the afternoon watching a baseball game with his dad. Her voice raised, Mom railed at Dad. Jerry Jr. squeezed his eyes shut, then went to the corner, picked up his sister, and took her outside, watching from the stoop as she toddled around the yard in the too-high grass, grass that Dad used to keep greener and better cut than any other house on the block. He sat there and watched the sun dip low in the sky. The game would be over by now and he wondered how badly the Cubbies had lost. He watched Jennifer sit in the flower bed, pulling the petals off all the tulips and dandelions; last year there hadn’t been any dandelions in there, just tulips of every color he could think of and some he couldn’t even name. Dad came out of the house just as the street lights were flickering on, suitcase in hand, and nearly tripped over Jerry Jr. sitting there on the step. He paused, looked down at his son, and Jerry Jr. stood up. “Well, son, looks like you’ll be the man of the house now,” he said as he clapped his hand on JJ’s shoulder for a moment, then threw his suitcase in the back of his truck and backed out of the driveway. Heartbreaking and your description made me want to cry.You write so well. I agree with Charmaine, the description is heartbreaking. You show the before and after so very well. Great 8. Lovely details. A very poignant portrait of a turning point in his life. This break had to have been coming for a while… yet it seems so sudden to young Jerry. I have to give the parents some credit for trying to protect their kids for as long as they did. But the suddenness of its collapse… that’s got to be a blow to all involved.